Have I made it clear yet that I like wings? I mean, why are there no good wing places in the Kalamazoo area…and why does Grand Rapids have so many? 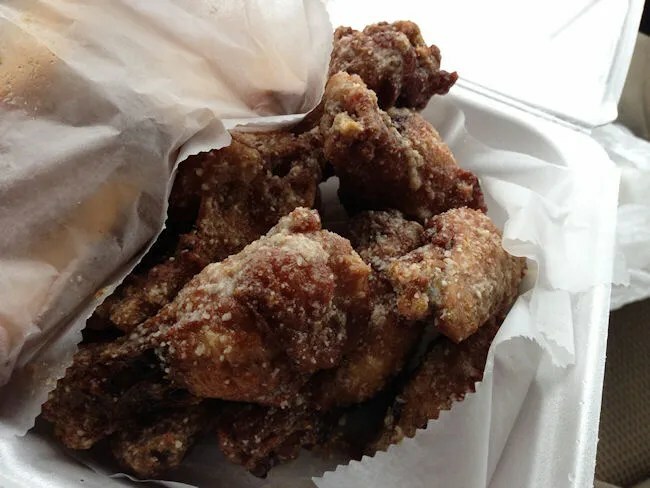 Even if they are all the same, at least I don’t have to go too far out of my way to find delicious wings in Grand Rapids. Last Thursday, I had sort of a slow day at work. 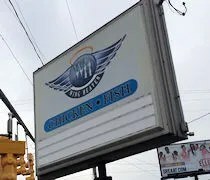 I was driving along US-131 and thought, damn, I want wings, so I did a search on Google Maps and found one sort of nearby. I pulled off the highway and put in a phone call to pick up what would become a delicious dinner. 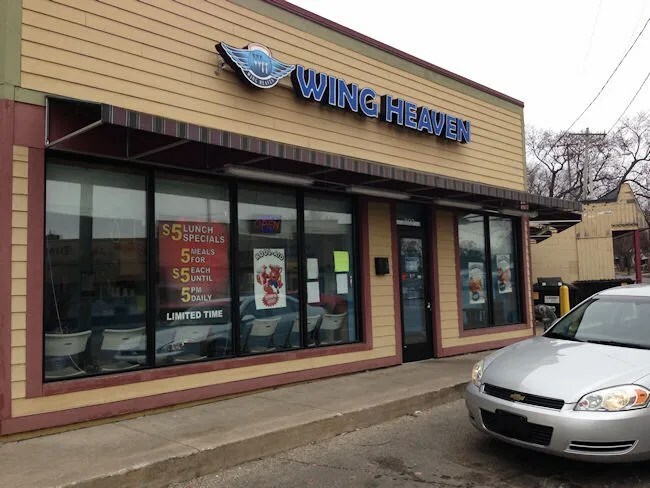 Wing Heaven has multiple locations around Grand Rapids. but the one on Burton Street seems to be under different ownership. The building is on the corner of Burton Street Southeast and Eastern Avenue. The oddly shaped corner building used to be a Sheldon Cleaners, but it has now been turned in to a take-out wing business with a couple of tables for those that just can’t wait to get those wings in their belly’s. I called in my order for nine traditional wings with a garlic Parmesan coating on them and a 1/2lb of potato wedges with salt and pepper. The order took about ten minutes and was being boxed up just as I was walking in to the store. I paid the bill which came to just a little over ten bucks then headed back to work to eat. Smelling the garlic the whole way back was such an incredible punishment, but worth it once I was finally able to crack open the box to eat. The wings were still piping hot and super crunch on the outside with deliciously tender, juicy meat underneath. The wings were quite large and actually kind of hard to get in my mouth, but I was determined to find a way. Those wings had to be eaten and size would not be a deterrent. The side item I chose were the wedges. They were well cooked with a crunchy outside and a slightly soft, but not raw middle. 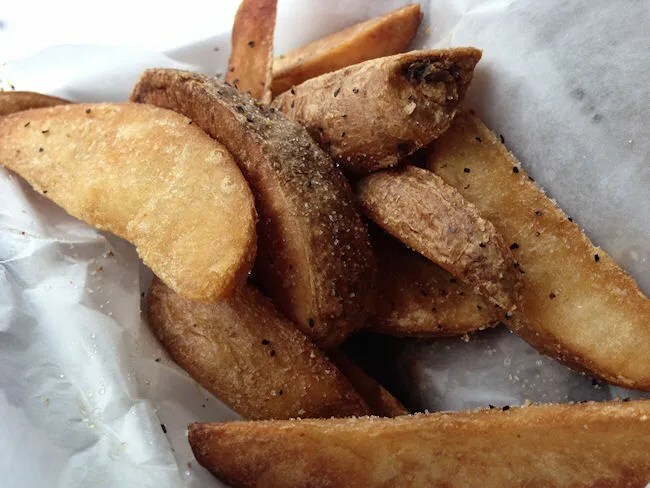 I still prefer fries to wedges, but these were cooked well enough that I barely even noticed. Like the wings, they were very hot even after I drove ten minutes back to the office. Seriously, why can’t Kalamazoo get a wing place like this? All the Wing Heaven’t are pretty much the same and they all have delicious wings. The Burton Street location is no different. Just delicious, delicious wings.